Crimea is a peninsula of treasures. Greeks, Ottomans, Romans, Scythians and many other great civilizations from the East and West fought for the Crimea, lived here, built cities and created works of art. However, even the greatest man-made works of art cannot be compared with those the peninsula’s nature has created. 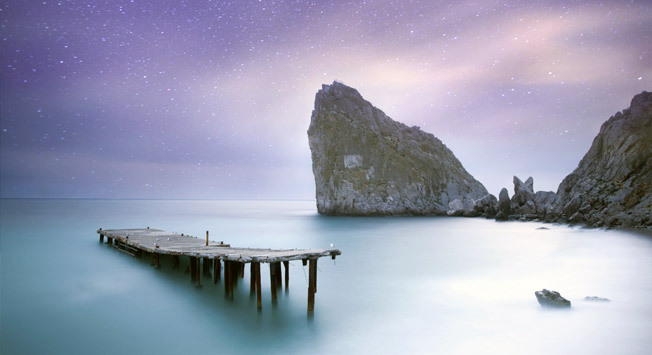 No wonder many call the Crimea a "Paradise on Earth ", according to scientists, 45 parallel, which is located on the peninsula, is our Planet’s golden section, one of the most favorable in terms of climatic conditions in places where you can live on Earth. The Blue Bay village is situated on the peninsula’s southern coast, 20 kilometers from the major city of Yalta. On all its sides, the village is surrounded by mountains – the Crimean Mountains from the north, and the Cat Mountain from the east, named for its characteristic shape. The climate here is dry and warm. The village’s history goes back to more than 3000 years ago. Here there was a road leading to the western part of the peninsula from the south, through the "Devil's Staircase” pass or the Shaitan Merdven. Apart from the “Devil’s Staircase“ it is also worth looking at the Lemenskaya valley, the Cat mountain, the Ai-Petri array, and the Swan’s wing rocks, Diva and Panea. The New light village originated in the late XIX century, thanks to Prince Lev Golitsyn, the founder of Russian winemaking; here he founded a factory for the production of sparkling wines. Originally the village was named Paradise, but after Nicholas II visited the place, the settlement was renamed the New World at the request of the king. Two of Prince Golitsyn’s palaces have remained intact, on the ruins of the Bosporus fortress there is a winery operating, through which the New World became one of the centers for quite profitable wine tourism. In addition, the village’s neighborhood is a conservation area – thanks to the relic juniper groves and picturesque coves with grottos. The most notable one is the Open–ended Grotto, which was chosen by the Black Sea pirates as a refuge many hundreds of years ago (people are still there looking for pirate treasure, and I must say, without success). The grotto leads to the Robber’s bay where pirate ships would stop in the days of trade with the ancient Greeks. This cave is unique for its beauty; it has many rooms and galleries, and an entrance at 920 meters above sea level. It was opened to tourists in 1989 and has the appropriate infrastructure. The tourists’ routes are a kilometer and a half long. The route begins in the gallery of Tales, with many stalactites and stalagmites. In the Perestroika hall (one of the largest in Europe) you can see the stone waterfalls, sinter columns and coral flowers. The cave’s lower gallery is a natural mineralogical museum. According to the speleologists, the Marble Cave is among the five most beautiful caves in the world, it is one of the most frequently visited caves in Europe. Located not far from the Bakhchisarai is the cave city of Chufut Kale, which was founded in the VI century. In its west, the most ancient part, numerous household premises carved into the caves survived, as well as the ruins of the mosque and the mausoleum that belonged to the Golden Horde Khan Tokhtamysh's daughter. Two Karaite temples and one living manor, consisting of two houses are also well preserved. There is also an 80-meter underground gallery, a 30-meter deep well, the remains of an ancient mosque, ancient Karaite cemetery, and sacred oak grove. Not far from Chufut Kale is the Holy Dormition Monastery, founded in the VII century, one of the oldest in the Crimea: a complex of churches and chapels, carved directly into the rock. The 30-hectare castle was built in the 14th century to protect the Soldaia Genoese colony in Crimea. The fortress is located on a cone-shaped coral reef, near the Sudak Bay on the Black Sea. During the second half of the 12th century envoys of the Byzantine state appeared in Sudak - Venetians, Pisans and the Genoese. They started to actively trade with the Russian, Polovets and Central Asian merchants. Gradually, the Genoese occupied the entire coast of the Bosporus (Kerch) to Chersonesos (Sevastopol’s modern suburb). Kafa (Feodosia) became the capital of their colonies in the Crimea, and Sudak – a military base. They started by building the Genoese fortress. In the place of the extant Sudak fortress, there were more ancient fortifications of the 6th century, which were built by the Genoese and merged into a single fortress. Many scientists have linked the appearance of the first defensive structures with the Khazars or Byzantines. In the territory of the Tarkhankut peninsula, in the western end of Crimea, one can see the remains of the Kalos Limen polis, founded by the Greeks Ionians, Scythian burial grounds, the two-century lighthouse. There is no river on the peninsula, but there are a few salty estuaries, the largest of which, Donuzlav Bay, is the largest lake in the Black Sea region. In the territory of the Tarkhankut peninsula, there is also is the famous monument of nature, Dzhangulskoe landslide Coast – here you can see a lot of bizarre rocks, landslides, avalanches, and rockslides. The whole of the peninsula’s coast is popular among lovers of diving, kite surfing and wind surfing. There is also the "Alley of the leaders" underwater museum at the bottom of the Black Sea, situated 12 meters deep, 100 meters away from the shore. If you dare to dive, you can see the sunken statues of Lenin, Marx, busts of Gagarin – high-profile politicians, as well as artists and heroes of the Soviet Union. In order to visit the museum, it is enough to rent equipment and be trained. The museum is located near the Olenevka village. The Ancient "Tauric Chersonese” city-reserve was listed by UNESCO as one of the 100 most outstanding monuments of world culture. Here you can walk through the ancient streets, see the old alarm bell and white stone columns of medieval churches, you can also wander through the ruins of the ancient theater. Chersonesos was founded by the ancient Greeks in the VI century BC, in the V century BC, the polis became part of the Byzantine Empire. For over 2,000 years, it was a major political and cultural center in the Black Sea region. Political opponents of the Byzantine rulers – Pope Martin, and deposed emperor Justinian II were in exile in Chersonesos. One of the oldest living cities in the world, Kerch (formerly – Bosporus) is located on the shores of the Kerch Strait. In the place where Kerch is today, the ancient settlement of Panticapaeum was founded in the V century BC, and not far from it you can see the excavations of the ancient city of Mirmeky founded by the Greeks in the VI century BC. Demeter’s crypt, an antique monument of the Bosporus painting of the 1st century AD is located in the city center; more than 20 ancient monuments of antiquity are situated around Kerch – from the Greek poleis, to the oldest churches in the territory of the CIS. In addition, the Bulganakskoe mud field (Crimean valley volcanoes) is located close to the town. Translated from Crimean Tatar, Bakhchisarai means "garden-palace." This is one of the most remarkable sights of the Crimea – the ancient capital of the Crimean Khanate. The main historical monument of Bakhchisarai is the Crimean khans’ palace – Hansaray. Hansaray is the world’s only model of the Crimean Tatar palace architecture. The oldest structures of the palace complex – Big Khan Mosque of the IX century and the Sary Gusel bath structures dated 1532.The Fountain of Tears in the Khan's Palace is glorified in Alexander Pushkin's romantic poem “The Fountain of Bakhchisarai “(1822). Apart from that, the Khan cemetery, the mausoleum of the beloved wife of Giray, Khan of Crimea, built in the XVIII century, the Falcon Tower and the Museum of Art are also worth seeing. According to the legend, British army soldiers during the Crimean War of the mid-19th century were so cold near the Crimean city of Balaklava, that they came up with a knitted cap by the same name. Translated from the Turkish language, Balklava means a "fish bag” or "fishing weather." Most likely, as early as the 1st century AD, a settlement in its place arose, which was repeatedly mentioned by Homer in his "Odyssey", who called the town Lamos. In the 14th century this Greek village came under the influence of the Genoese, who built a fortress Cembalo here – its picturesque ruins have survived to this day. Just a century later, the Turks, and another three centuries later – by the Zaporozhye Cossacks, captured the city. At the turn of the the 20 century, Balaclava turned into a favorite resort in the Russian Empire, Princes Yusupov and Golitsyn built their estates here. Its Soviet history is remarkable by the first diving courses established in the Soviet Union, and the underground factory for repair and supply submarines which was also built there.